When Yakima Valley asked if I’d like to check out some of the wineries in the Rattlesnake Hills I jumped at the chance. After all, almost anything that includes the word Rattlesnake and wine, has built-in allure, doesn’t it? Not to worry, the hills are not named after being filled with rattlesnakes, but after their curved shape that resembles a rattlesnake. At least, that is what I was told. If are wondering what a trip to Washington’s Yakima Valley might look like, check out their Instagram page for photos of wineries, outdoor adventures, and local flavors. The Yakima Valley is one of my favorite places to visit in Washington, and their feed showcases many of the wonderful things you can experience. There are almost 20 wineries in the Rattlesnake Hills AVA, and many have gorgeous settings with gardens, patios with views of vineyards and hills, and in the distance Mount Adams and Mount Rainier. There is also a Rattlesnake Hills Wine Trail with 11 wineries as well as a Rattlesnake Hills Wine Trail Passport. What is nice about the passport, is that it NEVER expires. And, passport holders receive special benefits like waived tasting fees and wine discounts at select wineries. Yakima Valley’s Fall Crush is a fun time of year to visit as harvest is over and production fo the next vintage is starting. Many wineries have events with grape stomps, food, tours, music and special releases. This year (2018), Catch The Crush happens 10/13 to 10/14. Wineries all over the valley will be celebrating, including many in the Rattlesnake Hills. If you want to see a list of wineries participating in Catch the Crush, click here. 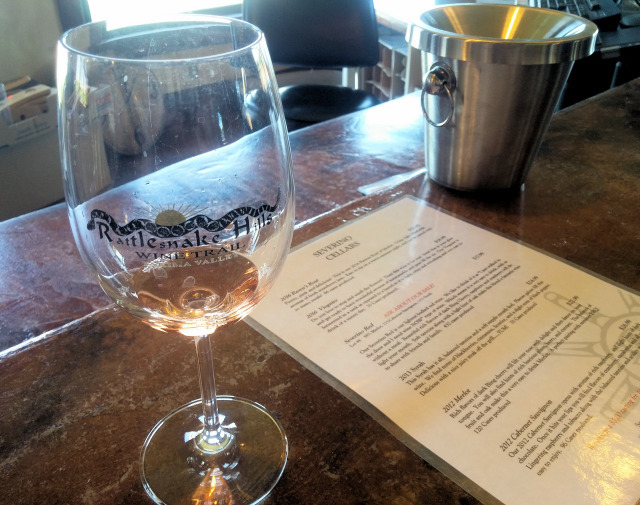 Ready to have a Rattlesnake Hills wine tasting adventure? The Rattlesnake Hills Wine Trail passport is only $10! waived tasting fees and wine discounts at select wineries. Before we get to the wineries, let’s first cover where to stay. During my Rattlesnake Hills wine getaway, I stayed at the Best Western PLUS Vintage Valley Inn in Zillah, WA. Situated in the heart of Yakima Wine Country, and right next to the Rattlesnake Hills, I found this hotel to be the perfect base for touring the wineries. 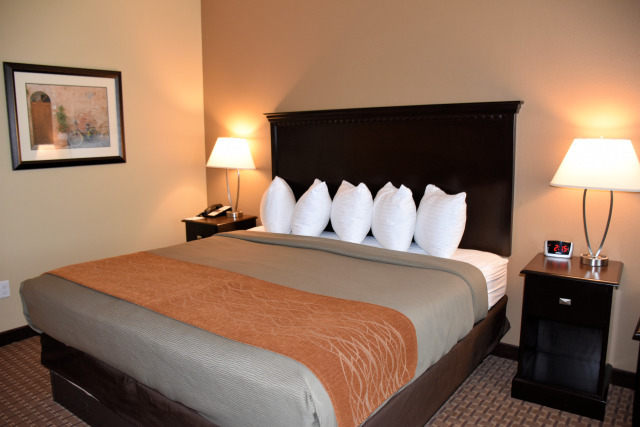 Not only did they have great service, spacious rooms, a complimentary full hot breakfast, an evening snack and a pool, but Rattlesnake Hills wineries are anywhere from 5-minutes to 15-minutes away, and downtown Yakima is 20-minutes. Travel Tip: The Best Western PLUS Vintage Valley Inn is dog-friendly. Now it’s time to check out your first winery – Severino Cellars. Severino Cellars produces wine tasting room is located in a turn-of-the-century farmhouse and has lots of charm with an outdoor patio and vineyard views. They produce wines grown from the own estate and vineyards and are more than welcome to bring their own snacks to enjoy on the patio. They also have seasonal events with food trucks and music. Depending on what time you arrived, you might have time to visit Horizon’s Edge Winery, which is a five-minute drive from Severino Cellars. Travel Tip: Many wineries have seasonal hours so please check their websites ahead of time for their hours. Travel Tip: Many of the wineries are dog-friendly. Travel Tip: On the Rattlesnake Hills Wine Trail Bonair Winery, Maison de Padgett and Silver Lake Winery at Roza Hills have WiFi. If you are in need of some sustenance, there are a handful of nearby choices. In downtown Zillah, The Chophouse at the Old Warehouse is probably the most unusual restaurant setting you’ll encounter. It is the former Perham fruit factory, turned auction house, with a restaurant, and downstairs is Perham Hall, a live music venue (check their website as they have some big names come through). In town, I heard good things about Squeeze Inn restaurant, and there is also there is also Stonehenge Tavern if you are looking for a local bar atmosphere, as well as, fast food restaurants near the hotel. If you want to kick off your first night with a special meal, I suggest driving to Yakima to dine at the new restaurant Crafted. The menu features shareable dishes, and I suggest ordering a few things to try. Also, make a reservation! This restaurant is new and very busy. Today is a full day of wine tasting, and the hotel breakfast will start your day out right. Enjoy a leisurely morning, or a dip in the pool, as many of the wineries open between 10 am to 12 pm. There are plenty of ways to go about your wine tasting day. I suggest picking between 4 to 5 wineries with the idea that you might like one location so much you decide to hang out there. The goal is to have an enjoyable wine tasting experience. For the Rattlesnake Hills Wine Trail, I would suggest going in a counter-clockwise direction, as it will put you in the right area for tonight’s dinner at Hop Town Wood Fired Pizza in Donald. On my trip, I tasted wines at two of the wineries on the wine trail – Severino Cellars and Bonair Winery. What started as a hobby, turned a hobby worth sharing for the owners of J Bell Cellars. The wine tasting room is elegant and has an outdoor patio with a fountain where you can sit and enjoy your wine with a garden view. They grow pears, cherries, and lavender, but no grapes as they don’t have the right soil. They do get all of their grapes from the Yakima Valley. On select weekends they have food, food pairings, and live music. I had a very unusual wine here – a Grenache Blanc – that I really enjoyed. 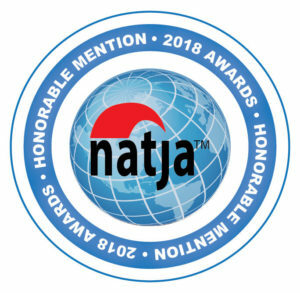 It is my understanding that there are only three wineries in Washington State that make this type of wine, so be sure to try that as part of your tasting. Bonair Winery has 40 acres of estate vineyards and gives winery ($10) and vineyard ($20) tours by appointment. Their wine tasting room has a European estate look with a patio and landscaped lawn overlooking a duck pond with coy and views of the vineyard and snow-capped mountains. Guests can bring a picnic to enjoy with their wine, and they also have tapas on the weekends, as well as live music for special events. Dogs are very welcome here (there is an off-leash area dogs can run), and they even have a bottle, Bung Dog Red, in honor of their Australian Shepherd. Knight Hill Winery’s former horse-barn turned tasting room with a 360-degree view will make an impression. Their wines are made with grapes grown in the Yakima Valley, and their own estate-grown Cabernet Franc and Syrah. Outside the barn is a patio with tables and chairs, and a large grassy lawn, which is perfect for enjoying a picnic, a glass of wine and the view. They have special events through the year, and dogs are welcome too. Travel Tip: Knight Hill Winery also has an Airbnb rental – Rooms with a View in Wine Country. If you are a first time Airbnb user, click here to get $40 towards your first trip. Note: No pets. That night, dine at Hop Town Pizza in Donald for pizza, salads, wine, and beer. The vibe is casual and fun, and their outside patio and beer garden is a great place to chill after a day of wine tasting, and if there is beer lover on your getaway they can get their beer fix. Another bonus is that Hop Town Pizza is only a ten-minute drive from the hotel! Can It Really be Almost Time to Go Home? If you can stay for one more day, that’s great! Select some of the wineries you were not able to see on the first full day. If it’s time to go home, you might be able to stop at a winery for another taste (I know I don’t have to tell you to be responsible, right?). On my trip, I was able to stop at Treveri Cellars and Owen Roe Winery in Wapato, which made my 5 Yakima Valley Wineries You Must Visit list. Treveri Cellars has free tastings as well as a tasty selection of menu items. And, Owen Roe has a fee for their tastings. 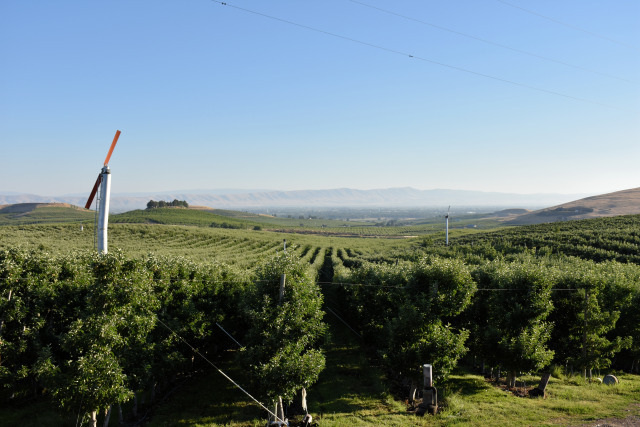 Each winery is close to the other, and they offer another unique Yakima Valley wine experience with amazing views. Winery Tastings: Most wine tastings are $5 and usually the fee is waived with a bottle purchase. Some wineries have no fees. 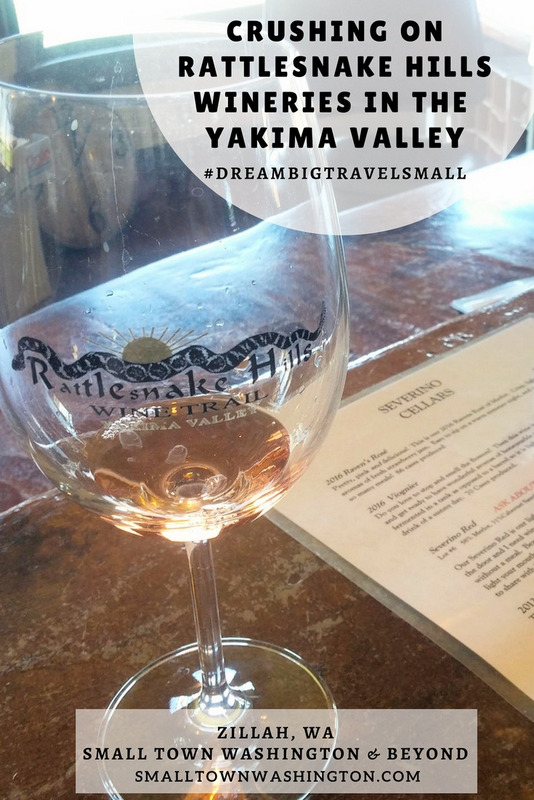 To learn more about nearby Yakima Valley wineries, Visit Yakima Valley and Rattlesnake Hills Wine Trail. We don’t normally do wine tours, but these Rattlesnake hills sound really interesting. Those corn and tomato-stuffed squash blossoms also look divine – only $13? Impressive. These wineries look so fun to explore! I actually didn’t realise Washington produced a lot of wine, curious to try it now! Katie, I hear that a lot. Washington is actually the second largest producer of wine in the US. It’s a wine lover haven! The first reading of the post makes the horrible thinking about a scary trip to a snake kingdom, but the experience you have described is absolutely nice and attractive. Such a surprise to read along the story. Long, Glad to hear I’ve intrigued you. I had such a great time and I wanted to share! I’ve always wanted to participate in a grape crush – but not so sure about tasting the end product before some serious processing 😀 For me, a wine region is as much about the food as the wine, and there are several serious contenders for my attention here as well. Finally, my uneasy relationship with snakes makes me want to visit – if only to find out whether or not what you were told about the Rattlesnake Hills being named after the shape, not the number of snakes!! Marion, I agree, wine and food go hand in hand, and there are plenty of great choices in the Yakima Valley. Kudos for wanting to face your rattlesnake fears. I saw a baby one on a hike last year. I liked seeing it, but it makes me uneasy too, especially since I was on the hike alone. I recently did a wine tour in Texas and thoroughly enjoyed it. Yours looks like fun! Tam, Wine and Texas! I’m in! I too think I would love the crush festival in October. There is something about a bacchanal fest that just sounds right. Eric, Thanks so much for commenting. The teapot is a tourist attraction only, but a fun one. I agree the Knight Hill Airbnb would be a good choice as the view from there is amazing, and they have a pool in the summer. The only downside is that if you travel with your dog it is not pet-friendly. Living in Oakland, CA, Napa and Sonoma are closer to us, but we like to explore other wine regions like Willamette Valley on the way to Portland, OR. Now we got to add Yakima Valley when we visit Washington State next! Patricia, I haven’t been to California wineries, but I’ve explored Oregon wineries. Washington has tons of places to taste wines. I would suggest Woodinville too as they have a ton of wine tasting rooms. I’m not familiar with the Yakima Valley so this was a fascinating read. It looks like a gorgeous area, I love the teapot service station – do they still serve fuel or is it just a tourist attraction now? The wineries sound amazing too! Susan, The teapot is not an active station, isn’t it cute! Glad you enjoyed the read and I hope you get to visit the Yakima Valley and go on some wine tastings. Anda, Wine tastings are usually $5, and often if you buy a bottle they waive the fee. You will find that some places don’t have a fee, which is nice budget wise. I have a dog too, so I totally get the worry about rattlesnakes. I can tell from your post that I would love visiting Rattlesnake Hills and its many wineries and food stops. Also, how adorable is that teapot service station! Can you actually get gas there, or is it just a fun photo op? Wish my parents had lived longer in Washington so I could have explored more! I didn’t get to see that much, let alone these beautiful towns and wineries! Thanks for linking up with #TheWeeklyPostcard! California Globetrotter, I am always amazed at the new things I discover in WA, and that there is so much to see. I hope you get to come back and do some more exploring. Everything seems so relaxing for a perfect holiday. I love wine county and although I haven’t visited one before, I always dream to visit one. Hop Town Wood Fired Pizza looks super awesome too! Chloe, Yakima is very laid back and a great vibe. Whenever I head that way I know I’m in for a fun time. I don’t eat pizza often these days, so it’s nice to indulge – so good. I hope you get to visit wine country soon. I love a good wine tour. 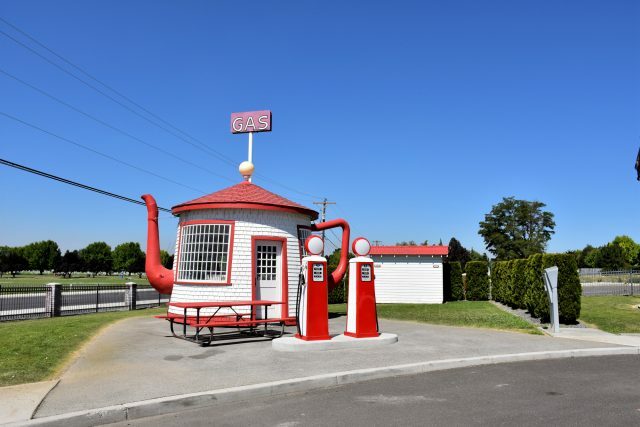 I had never heard of Yakima valley but it does look beautiful (especially love the teapot gas station). I could spend quite a while leisurely driving around and sampling the wine – must take some time to get around 20 wineries! The passport is a great idea. Emily, Driving through the hills is beautiful. I kept wanting to stop and take photos. Anisa, I hope you get to visit the PNW to tour and taste! Thanks so much for commenting. I love a good wine tour! I have family in Washington…maybe we can do this on our next trip out! Julie, Yes! You’ll love it! Harvest time is such a nice time to visit isn’t it? Lovely to learn about some of the wineries and where to stay locally and oh my I love that little teapot service station!!! Kavita, Thanks so much for commenting. I agree harvest time is a wonderful time to visit. Do you visit wineries often? Mark, Yakima is very laid back and there are a ton of kid-friendly wineries. I hope you get to visit one day! Thanks for commenting! I really need to make my way out there! Rattlesnake Hills sounds like a fun and delicious place to be. I was crushing on the squash blossoms and pappardelle photos – was that at Crafted? Francesca, You would love it. Very kid friendly too. Yes, that was at Crafted. So good! We love everything about this! We love to do these types of things. We’re adding this to our bucket list! I love wine tasting and testing out new wines from around the world. So tempted to enter the giveaway, but I know I am unlikely to get to the US any time soon. Josie, I totally get that. Keep the Rattlesnake Hills in mind if you come to the US and find yourself in Washington State! This wine trail looks amazing – I’d never heard of it before but now it’s definitely on my list! Laura, I hope you get to go tasting on the trail. Thanks for commenting! I’d never heard of Yakima Valley before but it sounds like my kinda weekend getaway destination. How much is the Wine Trail Passport? Sheena, The wine trail passport is $10 each, so if you plan to go it is a good deal as some of the wine tastings at the wineries are $5 per tasting. I hope you get to visit Yakima Wine Country soon! Melody, You’d love the vibe and food of crafted! I would go just to see the Teapot Dome Service Station, that looks really interesting. Obviously in Ireland there are no wineries to visit but I love going round whiskey distilleries!! I’ve always wanted to see a grape stomp, although I’m guessing that the one with Lucy and Ethel isn’t accurate. I’m very glad to know that there aren’t a ton of rattlesnakes in Rattlesnake Hills. I was a bit worried. The Crush looks like fun, and I like all the food options you give too. My kids would enjoy that Teapot Dome. I am a big wine lover and didn’t realize Eastern Washington was a wine region! If I ever am out that way I will have to check out these wineries! The fall crush sounds like a fun time to come out to enjoy the area! Can’t imagine who would refuse checking some wineries, or is it just us, but it sounds like an amazing time to explore the area and spend some fun time. The celebrations and special events and tours sound like just the perfect time to visit and experience the spirit! Sia, Fall Crush is a great time to visit, and if you are a beer lover there is the Fresh Hop Ale Festival at the beginning of the month. Thanks so much for commenting! All the wineries look awesome. I enjoy doing these as you can support local wineries and learn of their business. I also would love some of that pizza! Janie, Sounds like you’d love Yakima Wine Country. At many of these wineries, the winemakers are there and you can chat with them about how they got started and their passion for wine. Make for a more personalized experience. Weekend Haven, That’s one of the reasons I like to visit too. The name “Rattlesnake” scared me at first, but after reading about the history and seeing your gorgeous pictures, it is quite beautiful. Love the teapot dome and how conveniently located everything seems to be. The wines sound amazing and I’d love to visit during the grape crushing. Don’t know much about the wines from Washington and this is my kind of tour. Thanks for highlighting Yakima Valley. Rosemary, I hope you get to visit Washington soon and tour its wine country. Claire, You’d totally love it! Goodness, what a deliciously indulgent weekend. It looks like the perfect couples’ getaway. Glad you confirmed that the area isn’t overrun with rattlesnakes..not sure I could relax with the wines if it were so. The Severino Cellars’ farm house setting looks like perfection. Skye, Thanks so much for commenting. Coming from the Midwest I have a love of farmhouses, and they’ve really made it something special. Maegan, You’ll love WA wines! I hope you get to visit soon! Wow, that’s a lot of wineries in one day! I’m always envious of how some people can hold their alcohol. I did a wine tasting at *one* vineyard in Italy over lunch and basically fell asleep right after. That pizza looks absolutely delicious, though! Michelle, Oh gosh, I didn’t do four in one day, it was spread out over two days. 🙂 Much better that way. A good pizza is always a great way to end the day, isn’t it? Vicky, The landscape of Eastern Washington is so beautiful and Knight Hill Winery is perfectly situated to take it all in. What an exciting trip for you! Very glad to hear it’s not called Rattlesnakes because it’s crawing with them! Knight Hill Winery looks beautiful especially with those views out to the vines. I love exploring wine regions – so very picturesque (and the wine tasting helps!) Comprehensive guide. Juliette, Thanks so much for commenting! Wine regions are fun to explore, aren’t they? You do find the best wineries! I would love this one just because of the name, Rattlesnake Hills, sounds so exotic. LOL Great looking food, scenery, wine… what a trifecta.